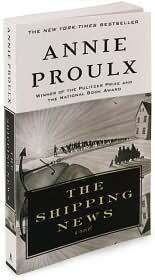 I can’t now remember what made me put Annie Proulx’s Pulitzer-winning novel The Shipping News on my TBR list, lo these many years ago. I do remember how many people were reading it when I was working at Barnes & Noble during grad school. I sold copies every day. Maybe that’s what lodged it in my mind as a must-read. It’s an odd book, about strange people in an isolated place, and it’s written in a way that could either grab you or repel you. I can see that it would get mixed reviews. But in the end, despite some reservations, I wound up mostly really liking it. The Shipping News is first and foremost about the chronically homeless coming home. Quoyle, a great clumsy lump of a human being, incapable of doing anything right, grieving after the death of his two-timing wife, blunders into the Newfoundland town of Killick-Claw, and begins to write the newspaper stories people want to read. His feral children slowly stop having nightmares. The family makes friends, finds a house, learns to cook. Quoyle’s aunt, Agnis Hamm, finds her niche in maritime upholstery. Boats sink or they float, according to their fate. People find the jobs they desperately need; they find the love they need, too. A house that has been out of place for a hundred years pulls up stakes. The background to this story of home is the story of Killick-Claw, and maybe the story of Newfoundland. The people of this town don’t accept poverty with weary resignation, they live into it with gusto, and they look with suspicion on anyone who wants to live any other way. Proulx doesn’t romanticize the hardship of this town — the unemployment, the overfishing, the long winter — but she makes it clear that this is home for these people, that they love it in an odd, fierce way, and that no matter where they go, it will always pull them back. Proulx’s style matches the frozen landscape and the cobbled-together characters, in a way. She writes clipped, staccato sentences, dropping pronouns or verbs, making curious, jerry-rigged junctions of images, adding headlines. For me, it really worked, because it dug into the book itself. I saw wit in it, and tenderness, and a great heart for language. I could see, however, that this is a style you’d either love or or find annoying. Me, I found myself smiling on almost every page. I did have a few reservations about the book. Proulx put so much into this novel that there were a few unsatisfying loose ends. The most blatant of these was the theme that ran through the book about sexual abuse. Proulx introduces the idea through a regular column in Quoyle’s newspaper, the Gammy Bird, and then, more personally, through a survivor in Quoyle’s own family, but then she drops it. Is it that nothing is to be done about such a pervasive problem? Are we to understand that this is a nasty Newfoundland tradition? If so, I didn’t like the way it was handled (or, rather, not handled.) There were a few other, smaller issues like this. Proulx was also a bit uneven in her treatment of her characters’ backstory. Some characters have shovelsful — Jack Buggit, the editor of the Gammy Bird; Billy Pretty, Agnis Hamm — and others we find out very little about, even though it would seem crucial to the story. These, however, are reservations about a book I truly enjoyed. The writing was wonderful, full of energy and vigor. The characters were sometimes lovable and always real. I am very glad I finally read this peculiar, ice-crusted, Canada-soaked novel about coming home. Yes, I saw a few bloggers who felt that way. I liked the style quite a lot, though. I was given this as a present years ago but somehow I’ve never quite fancied it. I really should give it a go, though, and your honest and insightful review encourages me. It has one thing I like a lot in novels, which is a strong sense of place (in this case, a place I’ve never been.) The characters are mostly kind of odd ducks, but they avoid the pitfall of being too “quirky,” something I don’t enjoy. I thought it was well done. Nice review. I love your description of her style. Here’s a review I posted a few months back. Thanks for the link — what a nice review! It mentions several things I omitted, so I hope people click through. I recently read Annie Proulx’s Postcards, another wonderful novel — here’s what I said about it: http://harrietdevine.typepad.com/harriet_devines_blog/2010/11/postcards.html. I love the way she writes, and I have this one on the TBR shelf. I think it had better come off there soon. Thanks. That sounds terrific. I am also quite interested in Brokeback Mountain — haven’t seen the film but would like to read the book. Thanks for the link! Lovely review. I have to say that I really loved this book, and have been planning to re-read it for ages. I think there’s something liberating about moving to live beside the sea which comes through powerfully in particular. Liberating is a good word. Proulx plays with the different ideas of feeling trapped or free. It’s a good novel. I have always wondered about this book… I haven’t seen the movie, and I think a few early reviews I read about the book were less than glowing in their response and suggested it was quite boring so that made me think it wasn’t worth my time. But lately I’ve been reading the opposite from well-trusted bloggers so I’m reconsidering my stance. This may very well be one of those books I wouldn’t have liked a few years ago, but may better appreciate now. I knew I’d read this, but couldn’t remember what I’d thought about it (or what it was about) until I read your review. YES. Your review is what I thought of it. The aunt was my favorite character, if I remember right. Oh, gosh, Swistle, thanks for coming by! (I’m such a fangirl of yours, I actually squealed when I saw your comment.) I loved the aunt, too, and she was given so much story. Very satisfying. I’d read some of her short stories, but this is the first thing by Proulx that I really loved. It lives in my memory, and it’s what I think of when anyone mentions Newfoundland (which, I guess, means I should read more about the place). I didn’t think the movie was too bad, either. I haven’t seen the film (Kevin Spacey, interesting) but I agree that this jives really well with my impression of the place. I love it when books are so evocative. It’s funny – I worked in a B&N when this book was really popular too, and I think all the big books from my bookstore days will stick with me forever. They jump out at me from tables, they jump into my head when trying to think of examples of genres, and I expect this will continue for a long, long time. (I worked at B&N 12-13 years ago.) This book in particular always seemed too earnest for my taste. This book isn’t earnest. It has a strong, willful, eccentric sense of humor running through it like a vein of quartz. Give it a whirl if it appeals at all. I loved the movie Shipping New even more than the book. It has become one of my favorites. I’ll have to see it! I never expect the film and the book to be much alike, but I like Kevin Spacey, so I’ll probably try it sometime. I don’t know what put this on your list, but I’m pretty sure Dave put it on mine back during my brief newspaper career–so 1999-ish. He thought I’d be interested in Quoyle’s newspaper work, and I was. Overall, though, I didn’t love the book, but I had a lot less patience with this kind of writing in those days. Yes, the older I get, the more I enjoy writing styles like this, as long as they’re not too overblown (which, in my opinion, this isn’t.) I am interested to hear you think Dave put this on your list. He didn’t mention having read it when I was reading it. I’ll have to ask! As a 19th century novel devotee, I particularly love the boldness of Proulx’s ending. It takes guts to write at such a high symbolic level as she does here. I always tell people that this novel, along with Richard Russo’s Empire Falls, recall the greatness of novels of the days gone by. Proulx’s other works (with the possible exception of Brokeback Mountain) don’t satisfy at the same level as this Pulitzer-deserving novel. The movie and the novel come from different planets. The ending was great! I actually think there are a number of novelists working today who could be compared to 19th-century novelists. Nice to know you have a list, too. I read this in college and LOVED it. I really should reread it. As for the abuse: I think it was not a story about the abuse, but about overcoming past. As I said, it’s been a decade since I read it, but I didn’t feel that was a gap for me. Have you seen the movie? Lovely scenery, although I think it has a different feel to it. I liked Proulx’s writing. Yes, but for me there wasn’t any sense of closure or triumph or overcoming to those stories. The ones in the newspaper were never dealt with at all, and the aunt was left at a loose end, too. So while I understand what you’re saying thematically, it didn’t actually work that way for me. I haven’t seen the movie, but I think I’d like to! I’ve never read Proulx, but she’s been about halfway on my radar for years. I might even own a copy of this book, but I’ve never gotten past thinking I should read her. Your review makes me think I should get a little more serious about checking her out, though; also, I just read Michael Crummey’s fantastic Galore, which makes me want to read more books set in Newfoundland.